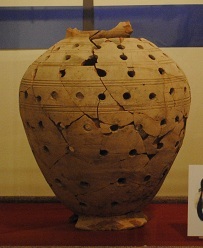 The perforated vessel (at right), has only recently been identified as part of the Ur Collection. Originally we did not know where the vessel came from or when it was made. Then, after a year and a half of uncertainty, we stumbled upon a beer strainer from Tell Asmar (Iraq) with perforations that highly resemble the ones in our mystery vessel. Now we can say with very little doubt that it is part of the Ur collection. Detail of the perforations found on the vessel. The vessel was in many pieces when it was was found in storage in January 2011. Glirarium - a place where dormice were raised and fattened for cooking. 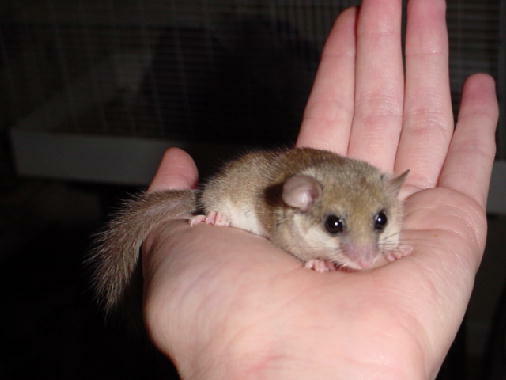 Dormice were a culinary delicacy to the Romans. They were kept in jars similar to this one, where they were fed nuts such as beechnuts, acorns and chestnuts. The inside would have been lined with ribs for the dormice to walk along. We suspect in this instance these ribs were added after construction. The dormice stored their food in the holes. "[The dormouse] is stuffed with a forcemeat of pork and small pieces of dormouse meat trimmings, all pounded with pepper, nuts, laser, broth. Put the dormouse this stuffed in an earthen casserole, roast it in the oven or boil it in the stock pot." Or click here to find out about another collection of unidentified artefacts . . .
What do you think this pot was used for?